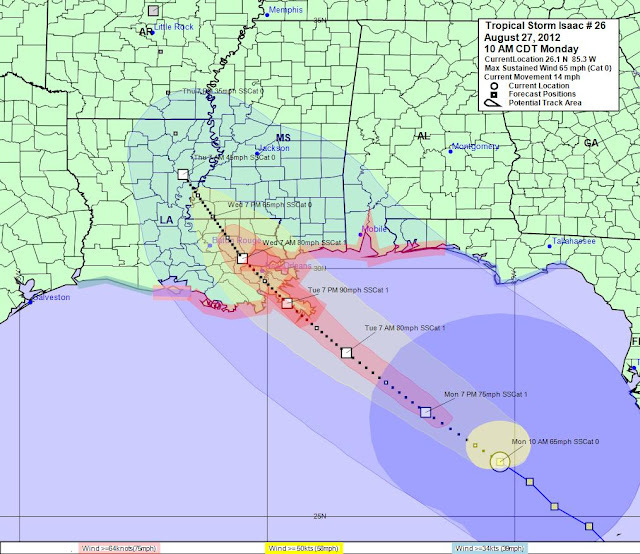 Tropical Storm Isaac continues to progress northwestward across the Gulf of Mexico. 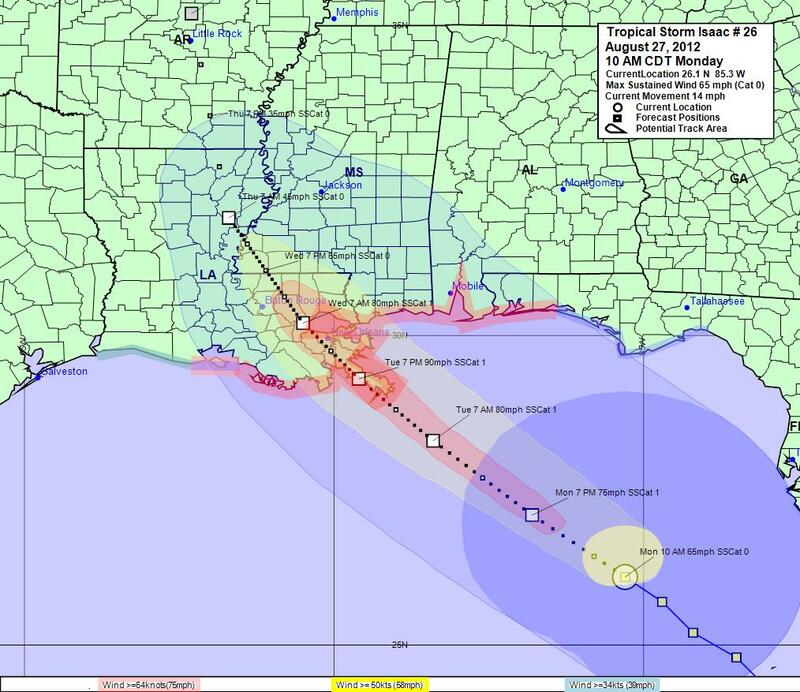 While the forecast track has shifted slightly west again, residents in Mississippi will still see effects from the storm's passage. Primarily, extended periods of heavy rain and high winds can be expected south of a line from roughly Greenville to Meridian. The following information reflects expected conditions for Washington County, Mississippi. 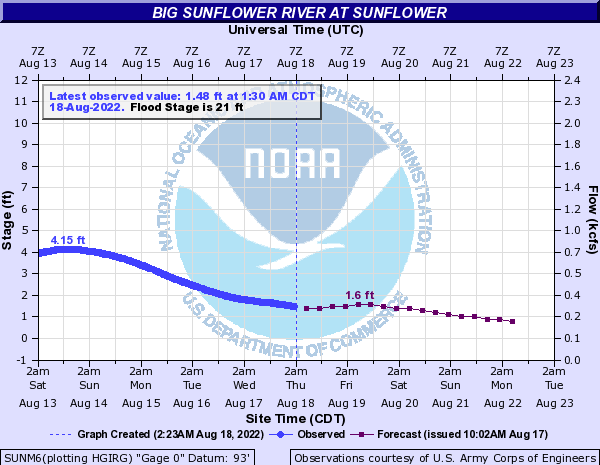 The information regarding times and wind speeds will be roughly the same for the neighboring counties of Sharkey, Issaquena, Humphreys, and extreme southern Sunflower. mb. Tropical storm-force winds extend outward up to 205 miles (335 km) from the storm center. (50kt/58mph) winds, and a 57% chance of at least tropical storm-force (34kt/39mph) winds. August 29, 2012 at 7:00 PM. Winds of this magnitude or higher are forecast to continue for 15 hours. 50kt/58mph winds are not forecast for Washington, MS.
64kt/74mph winds are not forecast for Washington, MS.
subject to considerable forecast uncertainty and generalization, especially if the storm is distant. here. Wind gusts and winds at higher elevations will be greater. Maintain at least a half-tank of gas in your vehicle until the storm is well past our area. Have water and ready-to-eat food available to supply your family for at least three days (5 to 7 days is better). Water needs = 1 gallon per person, per day. A 24-count case of 16.9oz bottled water contains 3 gallons, enough for three days for one person. Verify out-of-state contacts to communicate with. Sometimes local phone service may be affected, while long distance remains available.